Typically, only the rich and famous make the news when they take vacations, but it appears as though our family trips are now cause for headlines. 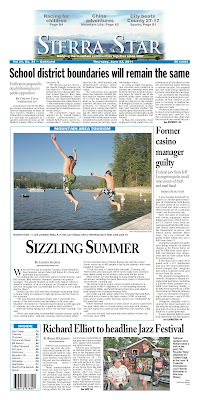 If you noticed the front page of today's Sierra Star, you can see a picture of our two younger boys jumping in Bass Lake. Tim is looking on from the inner tube in the background. 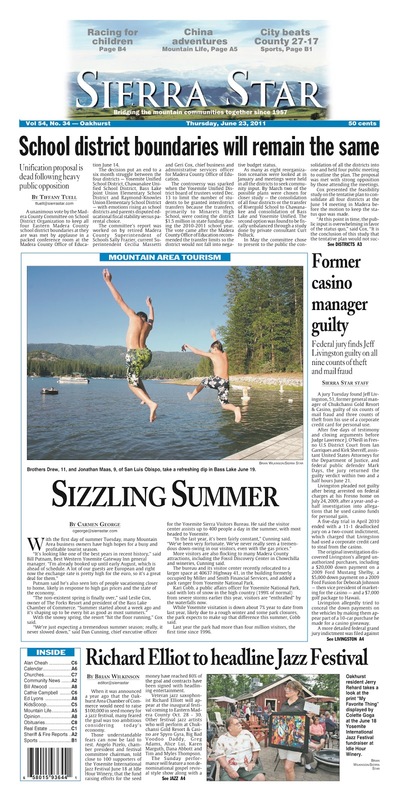 You have to figure this is a pretty nice place to live if an article on boys jumping in a lake is the top story. What a great photo and it's nice to be recognized. I can't read the print, though. We have had 2 sunny days in a row now!!! Our g-daughters went up to the lake to play in the sand. Since the ice finally went out I will have to assume that Fremont Lake is 33-35 degrees now - they didn't even put their toes in. I clicked on the image and downloaded it separately, then zoomed in, print was easy to read. Photo caption says "Brothers Drew, 11, and Jonathan Mass, 9, of San Luis Obispo, take a refreshing dip in Bass Lake June 19." The jazz festival article also makes me think, nice place.